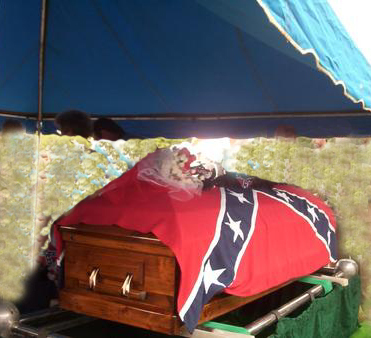 Final Confederate widow buried as re-enactors, members of heritage groups and friends gather for send-off in Coffee County of 'true Southern lady' Alberta Stewart Martin. ELBA -- There were cannon and rifle volleys with storm clouds thundering a response Saturday as dozens of Confederate battle re-enactors and members of Southern heritage groups gathered to lay Alberta Stewart Martin to rest. Martin, who died May 31 at the age of 97, was the last known living widow of a Confederate veteran. "She was our last link in a living chain to those who fought in the war," said Belinda Holloway, speaking for the Alabama Society of the Order of the Confederate Rose. Speakers including Pam Trammel of the United Daughters of the Confederacy said Martin, who was a member of the Greenville Guards chapter, was dearly loved by heritage groups. "We cherished the idea that we still had one Confederate widow in our midst. Her 97-year-old mortal body finally sought its rest." People from across the South packed the Elba First Assembly of God Church for the funeral, with women dressed in 1800s mourning attire scattered among the congregation. A band with antique instruments played the "peppy music" Martin asked for long before her death. As they struck up the notes of "Dixie," the crowd rose to its feet. Some clapped and sang along, some waved Confederate Battle Flags purchased and distributed by Tom Parker, Republican nominee for the Alabama Supreme Court. Soldiers in full Confederate uniforms stood watch, then escorted the horse-drawn caisson bearing Martin's body to the Ebenezer Baptist Church Cemetery. Sons of Confederate Veterans members Russell Darden and Ken Chancey discovered Martin was truly the last living widow around 1996. They promised to care for her and help her financially. After that, Martin traveled across the country for Confederate events and re-enactments, always supporting the Battle Flag. Chancey called her a "true Southern lady." He said she mourned for a lifetime the death of her mother when she was just 11 and could remember the poverty of growing up as a sharecropper's daughter. She told him of walking to school barefooted over a frozen dirt road, Chancey said. Martin married William Jasper Martin in December 1927. She was 21 and had a young son. He was 81 and had a $50-a-month veteran's pension. She called it a marriage of convenience. "She said hard times cause people to reach out to each other," Chancey said "and help each other -- even through marriage." People such as Annette Harrell came to the service. She brought her children at one time to meet Martin, to see a part of living history before it faded away, she said. Martin always seemed cheerful and loved meeting children, she said. Zula Andress was a member of the UDC in Greenville when Martin joined. "She was a lively lady," Andress recalled. "She was a sight." Martin's family members filled three pews in the church. Her son, Willie Martin, the son of Confederate veteran W.J. Martin, attended the service, as did Alberta Martin's sister. Alberta Martin was buried in the cemetery beside her husband of 50 years, Charlie Martin, the grandson of her Confederate husband. They married two months after W.J. Martin's death in July 1931. Chancey said Charlie was "the love of her life." After the service, the re-enactors filed past the grave, as did women in black hoop-skirts, rivulets of sweat trickling from their faces in the 90-plus degree heat. A man dressed in a kilt played "Amazing Grace" on the bagpipes, then a bugler played taps. After the service, many of the several hundred lined up for photographs beside the 5-foot-tall granite marker identifying Martin as the last living Confederate widow. Why did so many people work to raise money for Martin, to carry out the elaborate services? "It's about heritage," said family friend Ron Taylor, "about honor and about doing what you say you will do. We said we would fulfill the wishes of Mrs. Martin, and we did."